2018 Night of Hope for Heroes Gala registration is open! Registration opens for 2018 Night of Hope for Heroes Gala! 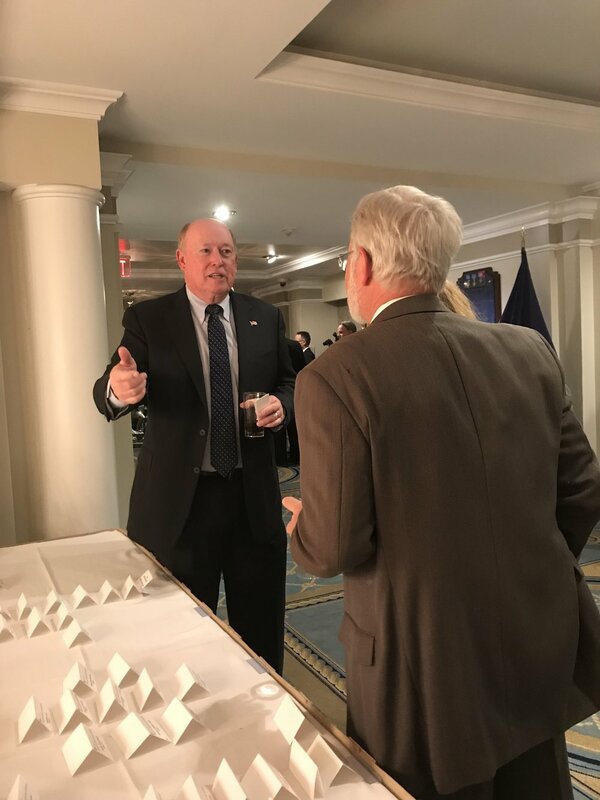 The Army and Navy Club at Farragut Square in Washington, DC was the perfect venue to raise money to provide PTSD/TBI treatments for our Veterans. Congressman Jim Banks, [pictured below] highlighted the extremely high suicide rates for our veterans. The Army and Navy Club at Farragut Square in Washington, DC served as a stately background for our 2017 Night of Hope for Heroes Gala. 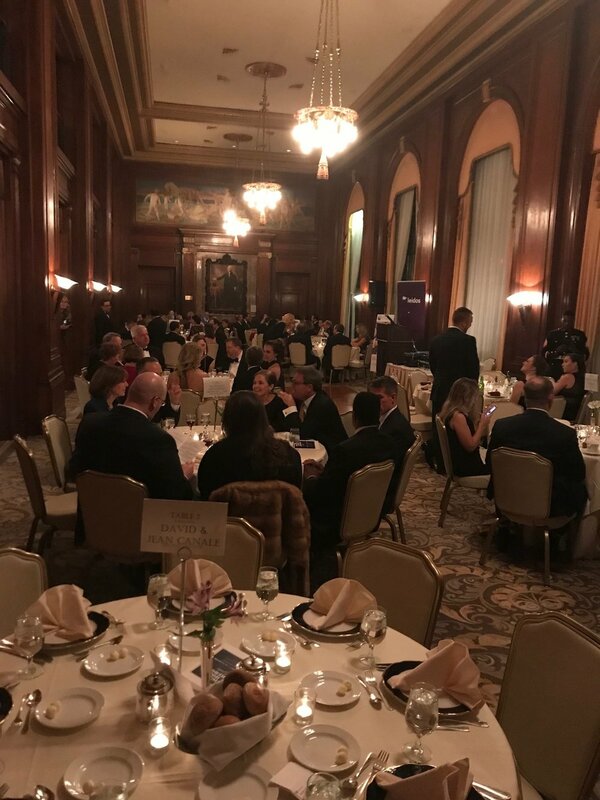 Tables were sold out weeks before the event and the excitement of the guests filled the historic building with a new hope for recovery for our modern veterans. 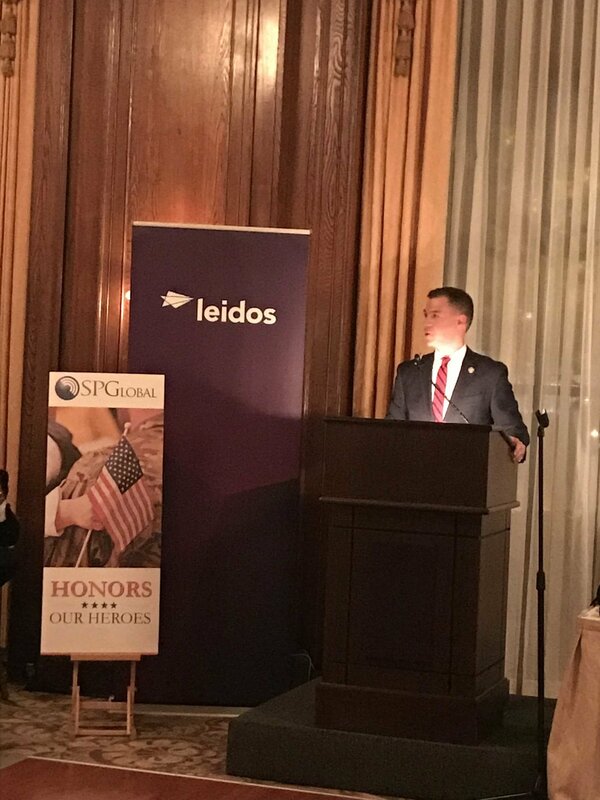 Congressman Jim Banks shared his story about running for office after returning home from his own military service in Afganistan and hopes to use his office to improve the lives of our veterans and active service military. Travis Stoufer shared how he flew across the country and lived in Bethesda for six weeks in order to receive the FNS treatment at the Brain Wellness and Biofeedback Center that put his brain - and life - back together. Krista, his wife, also spoke from her own personal experience. She described what their life was life with Travis before the FNS treatments and after. She remarked that when they visited Travis after three weeks of treatment, her 13 year old said that on a scale of 0-10, their dad was back to a 12!! His recovery exceeded their expectations. 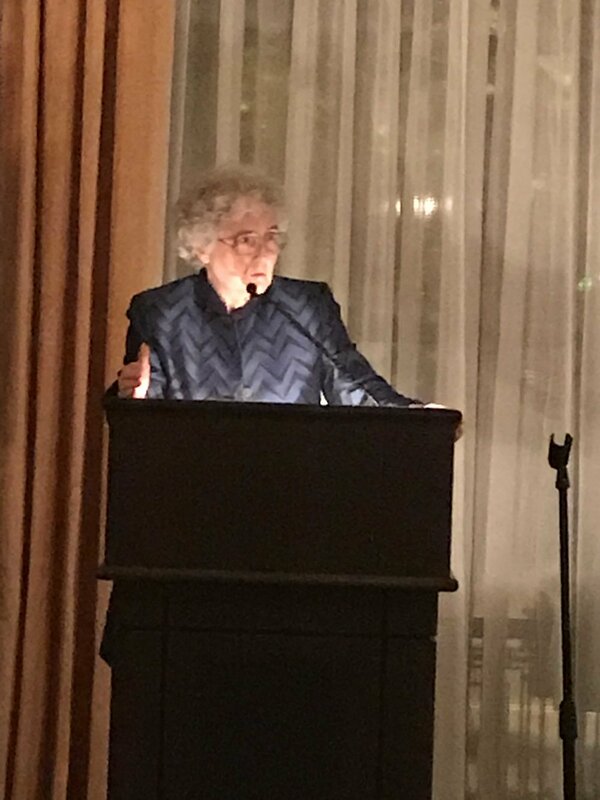 The Brain Wellness Fund Board of Directors would like to thank all of those who supported the gala and sent donations to help our veterans and active service members get the treatments that they need to regain their lives. We are hoping that people will continue to donate - its not too late to change a life! Just click on the donate button on the menu of this website. Special Deal: A $5.00 donation gets you a wrist band that entitles you to Happy Hour prices until 9:00 pm! Join in our 50/50 raffle for a chance to win big and enter a drawing for a chance to win a one-week stay in a beautiful Italian condo near Venice, Italy or a beautifully framed and autographed Orioles Hall of Famer photo featuring Cal Ripken Jr., Brooks Robinson, Frank Robinson, Earl Weaver, Eddie Murray and Jim Palmer! The Brain Wellness Fund was thrilled to welcome (now) Major Barry Crawford to speak at our Hope for Our Heroes event on November 12th – Major Crawford is not only a national hero, he is also a former client at the Brain Wellness Center and credits his return to duty to Dr. Mary Lee Esty! You’ll find a summary of the Major’s experiences in Afghanistan below, wait until you hear him speak! Capt. 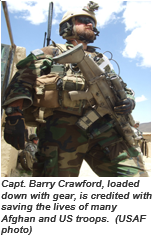 Barry F. Crawford Jr. was caught in the crossfire. He waved his arms toward the HH-60 Pave Hawk that hovered above as he ignored the bullets pelting the ground at his feet, kicking up dirt and rocks. His headset muted the sound as a round flew just past his ear, though he definitely felt the antenna of one of his radios slap the back of his neck hard after the bullet struck it. The special tactics officer thought he had been shot. He felt for blood, but there was none. He carried on. The US forces were acting as mentors. The idea was to put an Afghan face on the operation, intended only to be a regional engagement effort. The soldiers wanted to sweep the area and talk to the village elders. The area was known to be sympathetic to the Taliban, but the assault force—including nearly 100 US and Afghan personnel—only expected resistance from some 10 fighters. Unbeknownst to the troops on the ground, though, the mission had been compromised and insurgents had holed up in tunnels and caves in the mountains waiting for them. It turns out the assault force was ambushed by a highly capable enemy numbering roughly 10 times what they anticipated. As the troops entered the village, they quickly realized the normal signs of life were eerily absent. The villagers should have been getting up for their first prayer. Women, children, and men should have been moving around. "There was none of that, so our ‘spidey senses’ picked up and we knew something wasn’t right," Crawford told Air Force Magazine in an interview from Maryland where he is now assigned to the Air National Guard’s 104th Fighter Squadron in Baltimore, awaiting a pilot training slot. Crawford hopes to fly A-10s for the Guard. Throughout the course of the 10-hour firefight, Captain Crawford braved effective enemy fire and consciously placed himself at grave risk on four occasions while controlling over 33 aircraft and more than 40 air strikes on a well-trained and well-prepared enemy force," reads his Air Force Cross citation. "His selfless actions and expert airpower employment neutralized a numerically superior enemy force and enabled friendly elements to exfiltrate the area without massive casualties." If you were unable to attend, we will soon have the videos so that you can hear their amazing stories. And, you can still help. Thousands of our veterans are struggling every day with PTSD. Far too many are losing the battle. We know how to help them but we need your help to do it. Most soldiers, sailors, marines, airmen and members of the Coast Guard never waited to be asked. They simply stepped forward and raised their hands. Proudly. Quietly sacrificing what we take for granted every day. A goodnight kiss. Soft beds. Clean clothes. A child’s first step or parent’s last birthday. Baseball games, dance recitals, Christmas Eves and date nights. And a thousand other moments that will never come again. Instead of complaining they will tell you about wanting to give something back to their country. About becoming part of something larger. Protecting the freedom and values we all hold dear. Keeping loved ones safe. Being a part of a team committed to a mission and to each other. Knowing that team always had their back. The brave men and women of the U.S. military have always done their part. But have we done ours? When they literally lay their lives on the line, they do so with the belief that, when their tour is over, we will bring them home. All the way home — back to where they were when they enlisted. We don’t always do such a good job with this. Right now there are tens of thousands of veterans, our nation’s heroes, who are struggling with the never-ending nightmare of PTSD. They are losing their jobs, families, homes and self-respect. You’ve seen the stats — more than 20 times a day, a current or former member of our military commits suicide and a large percentage of that is the direct result of PTSD. By this point, you already know that. We all do. What you may not know is that we can help them. We know how to remove most, if not all, of the symptoms. The Brain Wellness Fund works closely with the Brain Wellness and Biofeedback Center in Bethesda, MD, where they are having a very high rate of success returning many of these current and former military members to who they used to be. Not simply masking symptoms with drugs — the treatment at BWB does not use drugs of any kind — but removing or significantly reducing them through a set of proprietary protocols that, in layman terms, reset the brain. This means giving them perhaps the first real night’s sleep in months, if not years. Alleviating the crippling anxiety and anger. Restoring lost memory and balancing energy levels. Getting rid of or seriously reducing the headaches. Minimizing the effects of flashbacks. Allowing them to reconnect with loved ones. The biggest obstacle to making this life-saving treatment available is lack of funds. We need the financial resources to reach them, bring them to the Bethesda area, assist with their lodging and pay for their treatment. All of this means that they need your help. Whether you can make a one-time contribution or a monthly commitment, whatever you do will directly make a difference in the life of a veteran or active duty service member. We go out of our way to walk across the room or stop them in an airport and thank them for their service and that is a wonderful gesture. But, how much more meaningful would it be to let them know that you have their back — that the battlefield may have changed but not the vow to “leave no one behind”? The holidays were an especially difficult time for those with PTSD. There’s something ironic about being so concerned about service members being separated from family during this time of year but allowing our heroes who have made it home to struggle with this awful condition. The Brain Wellness Fund is a 501(c)(3) non-profit organization, making your donation tax deductible depending upon your individual filing status and circumstances. The need is great and your help will be deeply appreciated. Please consider a monthly contribution. The work we do is on-going and those who consistently provide support make a tremendous difference. Stock donations to charitable organizations, like The Brain Wellness Fund, not only provide much-needed assistance — in this case, not just improving but literally saving the lives of our veterans and active duty service members struggling with PTSD — but they can also result in significant tax savings for you. If this is something you are in a position to do, please email bethmruk@gmail.com. Extremely proud of my man Drew Doudaklian Lucas! I couldn’t have asked for a better mentor as a young Marine. As Marines, we have this mask we put on and act like the experiences we had overseas didn’t take a toll on us but in reality there are so many veterans struggling with the transition home. I’m very pleased to see that you have found your calling and the work that you do is inspiring! Read more about Drew Lucas here. Brain Wellness Fund is registered as a 501(c)(3) non-profit.